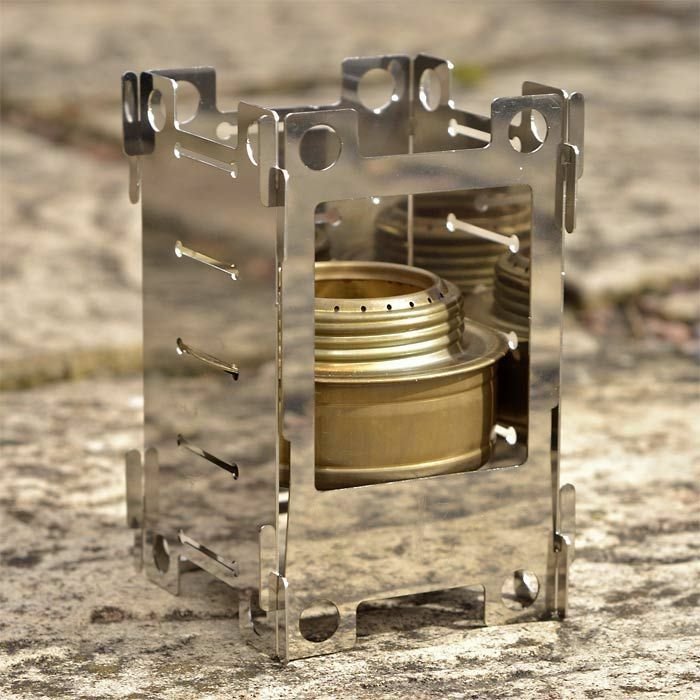 The Honey Stove has fast become the most popular wood burning camping stove in the UK, Since its launch in 2008. Rather than just sitting back and relaxing though, the Honey Stove team have continued to test and refine their original model, releasing the latest version in 2012, which Woodlore now have in stock. This latest version benefits from a slimmed-down and lighter Trangia plate, the inclusion of a square base plate, all topped off with a food grade 6 x 6 inch stainless steel cooking grill. Same weight, better product. With so many pots, pans and stoves being produced around the world, the end user is often left frustrated at having to buy a certain cooker to work with a certain stove which is fired by a certain fuel… The Honey Stove has been designed to act as a link between them all and is designed and manufactured right here in the UK. The Honey Stove allows you to use the cooking pot and fuel of your choice, while giving you the additional option of a simple wood-burning stove, thus making it flexible enough to match the time of year and the activity you are undertaking. Though it works primarily as a wood-burning stove, it is flexible enough to work with other cooking fuels, such as esbit/hexamine tablets, night light candles, any make of meths stove, Greenheat Fuel Cells and even the Trangia gas burner. 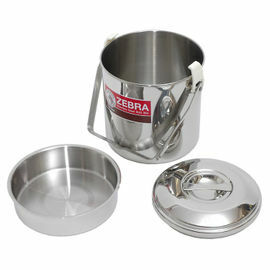 Any pot can be used with this stove, whether circular, like our Zebra Billy Cans, rectangular or even kidney-shaped, like the popular Crusader Cup. You also have the option to cook directly on the grills, making bannock, toast, croissants, grilled meat/fish, sausages and bacon a one-cooking system process. The stove system can be completely disassembled and packed flat, making it easy to store in your rucksack. It will also fit flat inside the traditional military-style mess tin. The stove pack consists of 9 pieces, made up of side panels, a fire door, a base grill, a mid grill and a top grill. There are a number of different ways to configure the setup of the stove, and you do not need to use all of the parts all of the time! Just select the multi-grill arrangement that best suits your chosen cooking method. The Honey Stove works best with small pieces of dried wood no thicker than a pencil; two fistfuls of these twigs will boil 500 ml of water in around 8-10 minutes. This is an impressive statistic, one that Ray put to the test and was very pleased to see ring true. 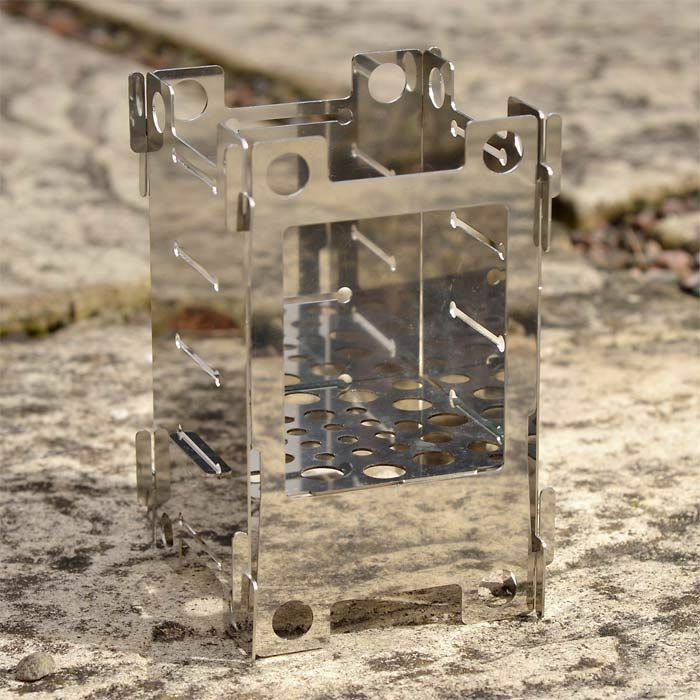 The Honey Stove - Stainless Steel is rated 5/5 based on 44 customer reviews. Very quick again! First class service, excellent product. Very impressed with this stove, tried it out a few days ago and it had a mess tin of water boiling in no time at all with just a couple of handfuls of finger-thick kindling. 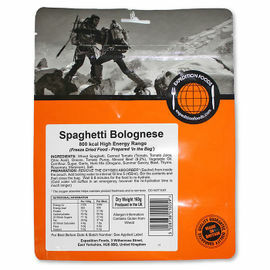 Easy to light, easy to feed, nice and lightweight, and packs small vs a gas stove. It does take a bit of practice putting it together, but nothing too difficult. This will definitely be in my kit, nested in my mess tins with a few solid fuel blocks just in case. Excellent. Does everything it was expected to do and packs down super small. Well made stove that packs away to nothing. Great to know it is made in the UK. By far the lightest stove I have seen or used and it works great. Nice and stable with a 14 cm pot - and of course it uses fuel that is free. Will definitely be the stove of choice for summer trips where dry wood is plentiful. We absolutely love this stove. We just went camping for the weekend (3 of us) and it was all we needed. Fabulously small to pack, and very efficient. We used a small number of sticks, despite cooking three proper meals a day. It was stable, lit really easily and quickly, and coped very well with the wind. We were previously using a propane gas burner, which had been given to us (it actually blew up on our last trip); I would never go back to one of those now. I love the honey stove! This stove is fantastic! It's light, less than most gas stoves and a small canister, it packs away neatly in a pouch, which is only about 0.5cm thick and it's sturdy. The big advantage of this stove is that you don't have to carry lots of heavy fuel with you, particularly if it's a longer trip and it heats up water or food very quickly with the flames and heat being concentrated within the stove. The 12cm Zebra Billy can fits snugly inside the rim of the stove on tent pegs, that can be used to adjust the height of the stove. The size of the stove can either be decreased to a small pocket stove, using just four panels or, made larger by buying the extension kit. Highly recommended. I am very happy with this stove. It isn't the lightest, but everything else is excellent. Don't let the weight put you off. I use it a lot with a Zebra Billy Can on top and the fit is perfect. The trangia adapter works fantastically. I can't rate it highly enough. Very smart item. The materials are of high quality and are well finished. 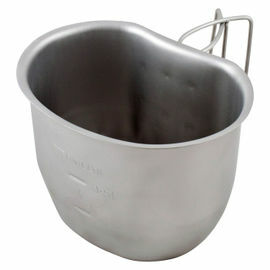 Supplied in a nylon bag and is compact enough to be stored in a 14cm billy can almost flat. You would struggle to do the six sided combination and store in a 12cm billy due to the base diameter (gives rigidity). Quite a pain to construct. Not found a surefire way yet to build quickly and quietly without bits falling off. In the square configuration it will take an Esbit burner, however the sides bend out slightly; wonder if a Trangia stove is just a bit smaller and that's what they are basing it on, works nonetheless. 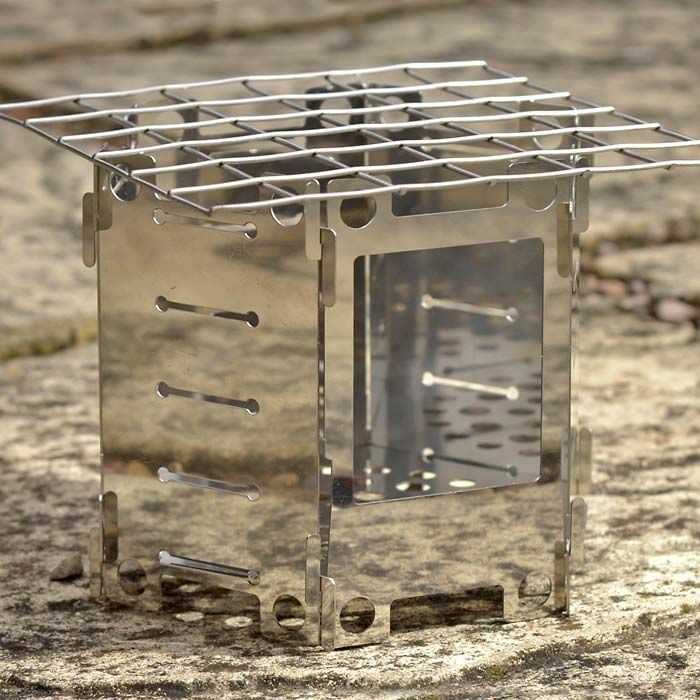 Esbit sits fine in the 6 sided configuration in the dedicated stove holder. Once again rapid shipping from Woodlore to me. Tried the Stove this morning (admittedly in my garage and not the woods as I was trying to fix my motorbike). What a clever design, after a bit of fumbling the panels fitted well and was very stable with my trusty Crusader cup boiling quite soon. 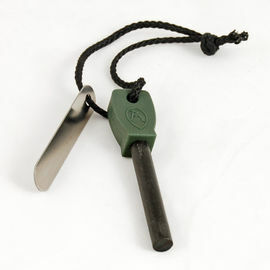 I feel that it will be an invaluable bit of kit as the local woods have a strict no campfire policy but seem ok with small stoves, takes up almost no space in a Bergan or day sack and works well with both a meths burner and the wood scraps that always seem to build up around the front of the garage where I have been known to carve the odd spoon or two. only down side that I can see is because I no longer have to go back into the house to make a brew I may become estranged from the wife. Top bit of kit. 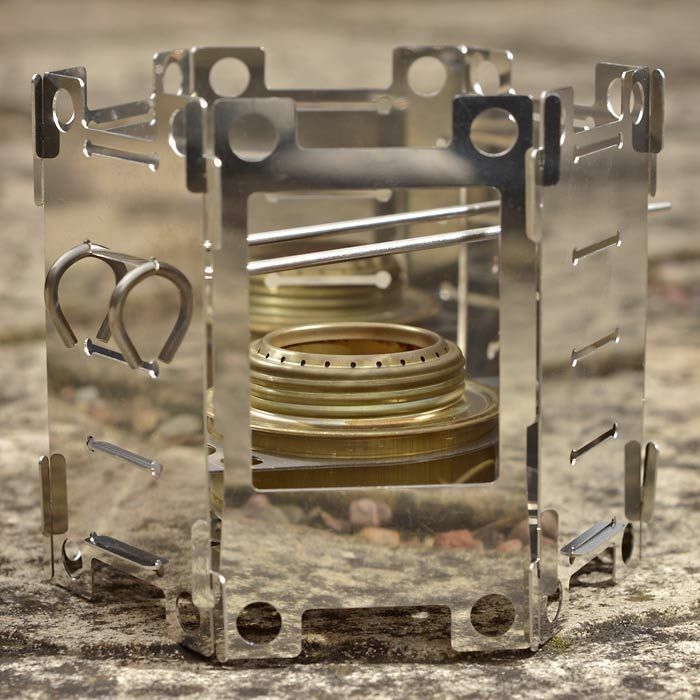 A fantastic design achievement and a super versatile stove. Very pleased with it.